Dunbar and Boardman: Who Built the National Lift Tower? Who Built the National Lift Tower? 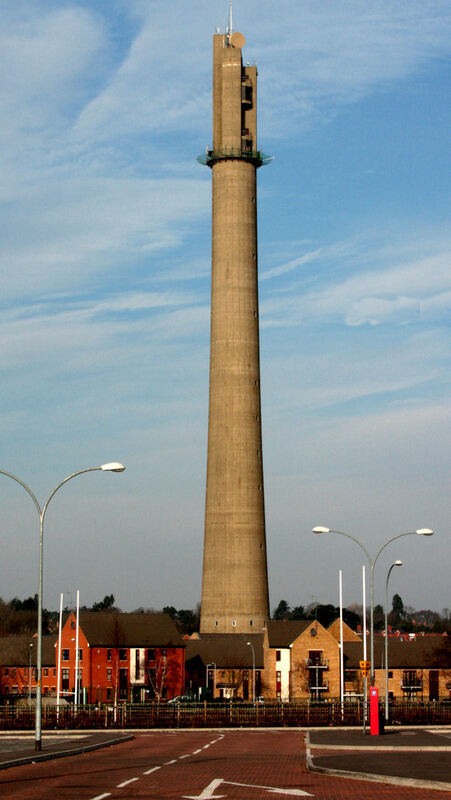 The National Lift Tower also known informally as the Northampton Lighthouse is a 127m high tower located off the Weedon road in Northampton. The Tower contains six lift shafts of varying heights and speeds, one of which is a high speed shaft with a travel distance of 100m with a theoretical maximum speed of 10m/s. The Express Lift Company built the Tower to test lifts in 1982 and it then became Britain’s tallest lift testing tower. The Express Lift Company was formed in 1917 when two companies merged; those two companies were Easton and GEC elevators. An engineer by trade, Josiah Easton had founded Easton in 1822. After an initial failed working relationship with Richard Waygood of Waygood & Co, Easton went on to establish The Easton Lift Co as one of the most influential lift companies in Britain and the world. Notable installations include the first lifts in the Greenwich and Woolwich Tunnels under the Thames. The General Electric Company (GEC) began working with Easton during the First World War. Easton was making ships hoists, derricks, hydraulic ramps and small lifts for the Royal Navy and the electrical drives were supplied by GEC. From the outset, the Express Lift Company was headquartered in Northampton. In 1925 Express introduced the gearless self -levelling lift using American sourced components. In 1928 Smith, Major and Evans, the first British manufacturer of gearless lifts, merged with Express. In 1929 Express achieved a special engineering milestone when they installed hydraulic equipment to raise and lower the dance floor at The Savoy Hotel in London. Over the following decades there were many notable installations including the company’s first escalators at the Earls Court exhibition centre in 1932. In May 1960 the company completed an installation of 25 lifts, 17 at Bucklesbury House and 8 at Temple House. In 1978 Express completed the installation of 22 high speed lifts including five double deckers at 1400 ft. per minute in what was then Europe’s tallest office block, The NatWest Tower. The National Lift Tower, constructed in 1982 is perhaps the most tangible construction that Express were responsible for, at least in the minds of those not involved in the vertical transportation industry. A smaller testing tower measuring 60 metres in height had been built by Express in 1932 but by the 1970s it was clear that with the advances in the vertical transportation industry a new taller testing tower was needed. The Express Lift Tower (now known as the National Lift Tower) was built for this purpose. Construction commenced in 1980 and was completed in 1982. You can watch 1980s video of the National Lift Tower here. It is no longer used for lift testing but is used for testing of the following: height safety and access equipment, escape systems for offshore platforms and vessels, Novel systems for use on underwater cranes. In addition it is also used for lift engineer training, lift equipment development and telecommunications testing including long range high speed wireless broadband. What happened to the Express Lift Company? The Otis owned Evans Lifts purchased the Express Lift Company in 1995 and in 1997 Express Evans was folded into the Otis group of companies. Dunbar and Boardman is the lift, escalator and access equipment consultancy. Are you currently planning a project that will involve vertical transportation? We would be happy to discuss with you. Give us a call on T +44 (0) 20 7739 5093 or send us an email via peterboardman@dunbarboardman.com to start the conversation. We look forward to hearing from you.